The PHANTOM1 imitation security camera is an easy way to deter intruders or vandals and make your property appear to have a robust security system. The aluminum housing and cable make it look like a real, functioning camera. It can be used in combination with a functioning security system to heighten the effectiveness. Customers, neighbors or visitors will all think that you have a robust video surveillance system. This imitation camera looks just like the real thing, so use it in your business or home to help prevent vandalism and theft! The design of the PHANTOM1 is based on an actual camera, making it a realistic crime prevention investment. Make people think twice about stealing or doing damage to your property. Use it to help prevent and deter suspicious activity by placing the security camera in a noticeable area. You can easily mount the PHANTOM1 on your ceiling or wall and aim it using the adjustable bracket. This makes the imitation camera incredibly easy to use and adaptable to many locations. Deter suspicious activity inside and outside with the PHANTOM1. The imitation camera is made of anodized aluminum for durability and will not rust. This makes the PHANTOM1 incredibly versatile and practical for convenience stores, parking lots, apartments, entrances, and many other places! Built to resemble Defender’s SPARTAN1 functioning security camera, this realistic imitation security camera is versatile for your convenience and peace of mind. The aluminum housing and cable make it look identical to a real camera and is a cost effective crime prevention investment. 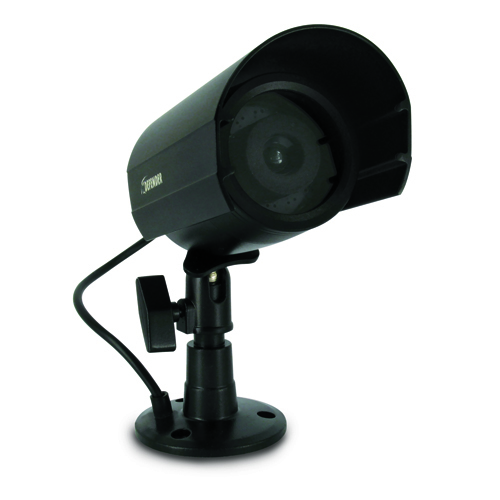 Pair the PHANTOM1 with any of our security systems for an affordable solution and a more robust-looking system. PLEASE NOTE: Imitation cameras are commonly used in noticeable areas to deter thieves and vandals away from a person’s property. The presence of a camera (functioning or not) may cause the intruders to abandon their plans and move on to another location. We always recommend using imitation cameras in conjunction with a functioning surveillance system for increased security.